Ok so I may or may not have a slight case of baby fever. With Lindsey being pregnant and at least 2 of my other good friends are expecting. My friend Paige just had the cutest little boy, Remy. We went by and saw him and he is adorable! Once he started crying I lost the trace of baby fever I had! Friday night we played this insane tennis racket and tennis ball baseball game with the youth and had ice cream sundaes. Fisher loved the whipped cream! Saturday Tan Man had one of his last Tball games and got 4 outs in the game! He's doing so well this season. After his game we ran some errands and had lunch at Picklefish. and dessert at Cold Snap. Saturday night we went to dinner with some friends of ours. We went to Fuego and then to Moka's for their fondue. We went to Exit 13 for Ryan to get a tattoo but the wait was way to long so we left. This morning our sweet baby girl moved to UpTown at church. She was so excited and spent forever trying to figure out what she should wear so she wouldn't look like a baby. UpTown is the 6-11 year olds. I can't believe she's in the same group as 11 year olds now! What?!?! Where does the time go?? This afternoon we went and grilled out and swam my friend Lindsay's parents house. We had a lot of fun! The kids are worn out from the weekend we had! The feelings mutual and I'm now headed to bed. Hope everyone had a good weekend! I have waited to say on my blog, even though everyone knows now, that Lindsey and Brandon are expecting!!! She is about 16 weeks now and went on Wednesday to find out what she is having. Those of you that know her story can only imagine how nervous she was about her appointment. I'm happy to report that everything is fine! Although her little baby was to stubborn to cooperate and find out what she was having on Wednesday she did find out that the baby was healthy and growing on schedule. She did go back on Friday for another ultrasound and found out that she's having a girl! When I told the kids Ryleigh started screaming with excitement and Tanner started crying. His exact words "Another girl!?! Ugh!!!" Yes Tanner, another girl and we couldn't be happier! I'm going to be an Aunt!!! Woo Hoo!!!! Congratulations Lindsey and Brandon! 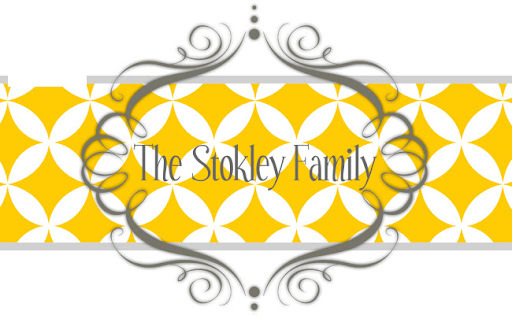 We can't wait to meet Blakeley! We are so so so proud of Whitney! She completed her first half marathon on Sunday and she rocked it! We got up way to early on a Sunday morning to drive way to far to watch her cross the finish line and I'm so glad we did! The kids had a sign to hold u, It said "You may not be the fastest but you are definitely the prettiest and that's all that really matters!" I really wanted to make the sign say "You may not be the fastest but you are definitely the prettiest (Just be thankful I'm not running or you'd be neither.) Everyone loved the sign! Here she comes, here she comes, here she comes!!! I was yelling this at everyone. She finished in 2 hr 48 min but it was really like 2 hr 40 minutes because she had just walked out of the bathroom when they shot the gun to start the race. She ran with 3 of her friends and they all did excellent! Tanner asked Whitney if she won the race and even though she didn't technically "win" she's a winner in our book and we love her so much! We are so proud of you Whitney!! I know this is late but bare with me. It's been a crazy week! I also hid eggs all over the house and they had a lot of fun finding those. They had a few trinket type things in them. We all went to Mom's church (our whole family) and it was nice to all go to church together even though Ryan and I both really missed our church. This was taken right before we left. I'm not completely sure what she had just done to him (Ryan took the picture) but it could not have possiblly been nice. After church we all went to moms to eat lunch. and hunt Easter Eggs, again, for the 100th time that weekend. I love pictures like this more than any other ones. Their personalities just shine through on them. After lunch we played volleyball. I think everyone was kinda surprised that I'm actually not terrible. It was a lot of fun but really, really scary because the boys like to spike the ball and it's no secret that they are huge! I kept thinking they were going to spike it at my face and break my nose or fall and land on me! Evan got the ball stuck in the tree and had to come up with a way to get it out. Love this picture of Tanner and our soon to be marathon runner! We are proud of you Whitney! Happy Easter! I hope everyone had a great Easter weekend!